NKT leadership's prime directive - ruin the Dalai Lama. NKT proclaims that the Dalai Lama has no leadership role in this world, neither spiritually nor politically. The entire 600 year history of Dalai Lamas is all false at NKT. NKT's religion - hundreds of millions of people around the world, anyone who considers the Dalai Lama a holy man or one to be appreciated, are all wrong and part of some conspiracy directed by Hitler and the CIA. 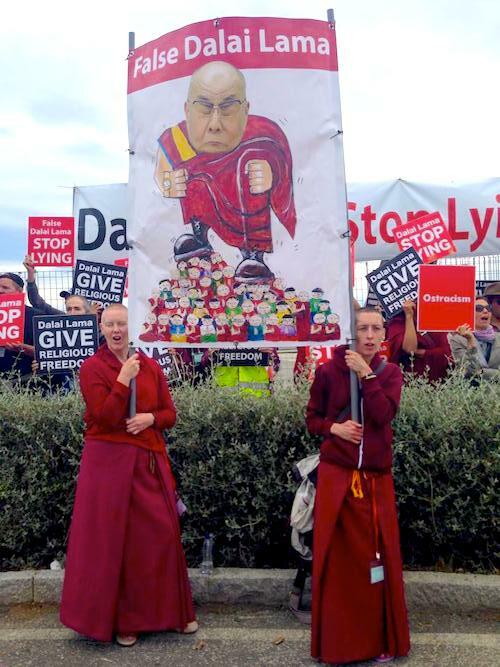 Still, NKT protests the Dalai Lama around the world, spending governments subsidies to ridicule the Dalai Lama. Most saddening is that NKT thrives on its political machine, gullible followers and illicit subsidies.